Drones are a multi-rotor, remote control flying objects that provide a new way of looking at the world around us from a whole new angle. We can definitely share those moments through photos and videos. Many remote control drones provide the first person viewing feature. This feature puts you in the driver’s seat on an extraordinary ride where you can explore and even participate in a race. 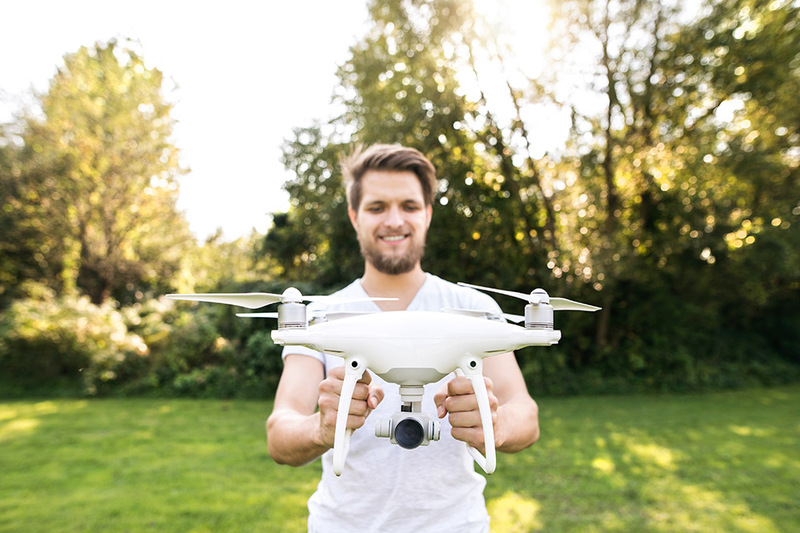 If you wish to compete in an air race or perform tricks and stunts with your budding fliers in an air exhibition, then becoming a drone operator might be a really good idea. Drone prices vary a lot and buying the best drone under 100 with camera is not easy. Drones can cost you less than twenty-five dollars, and it can go up to several thousand dollars. One thing you should understand is that the best drone for you is not necessarily the most expensive one. The one that suits your controller movement and driving techniques are the appropriate ones for you. Toy Drones: Toy drones are generally small, lightweight, and designed to fly smoothly indoors. Their compact size and complex technology make them difficult to control outside, especially when there is a strong wind. Toy drones with the camera will capture lower quality photos and video than highly expensive photography drones. Photography Drones: Photography drones are usually big in size, heavier than toy drones and much more expensive than usual drones. They are specially designed for outdoor operations and aerial photography. These drones are great for flying around a park, taking cool selfies, and getting a bird’s eye view of your neighborhood. While buying a photography drone, you will want to check the camera quality, including the megapixels and video resolution details. Racing Drones: Racing drones are small quadcopters that are purposely designed for forwarding flight and are meant to compete in racing and other drone exhibitions. These drones are built for high speed, mobility, and durability. Their parts can be changed, but it can affect the acceleration, accuracy, and control of the drone. Accessories And Add-Ons: Drones with enough lift from their motors and propellers can be supported with additional parts. You can check the item’s details for the lift capacity of your drone. Drones that are manufactured to uplift an external camera can carry a half pound or more of additional weight beyond that of the drone itself. The additional weight will increase the pressure placed on the drone’s motors and may decrease flight time and affect your in-air movement. Drone Batteries: A drone battery offers five to twenty-five minutes of flight time on a single charge and can take more than an hour to recharge fully. You can also remove the exhausted battery with a new one and enjoy extended flight time with your drone. Drone Remotes and Controller Accessories: The drone remote sends your commands directly to the drone’s flight operator. Then depending on the drone’s level of intelligence, the drone judges a variety of external factors such as wind direction and air pressure to turn your commands into action and conduct a smooth flight. New users can face many issues with proper GPS monitoring, not having enough knowledge about how to operate the drone if the signal gets disconnected, or in case the signal starts to act unnaturally. And if this ever happens, it is very obvious for the rookie pilots to crash their favorite drone into the buildings and destroying it completely. This is the reason why it is so necessary for a new drone user to start practicing on a low price range drone. Though, all these drones in lower-priced category look quite similar when looking for the best drone under 100 with camera. The Eachine E58 drone is very easy to use even for a first-time flyer. The remote control is light-weight and comfortable to carry around. Changing direction of Eachine E58 drone is quite easy even in strong wind conditions. The setup process for this model is very simple, and given instructions are straightforward. The camera is 720p, and the frame rate to any latest iPhone looks quite smooth. The video recording quality is good enough considering the price. You can take satisfactory images even at night. With Wi-Fi support, you can access the real-time camera mode of the drone. This is probably the best drone under 100 with camera. The drone comes with foldable body pattern, and the four arms get into a compact state. You can smartly plan to use the box as the supporting quad and also the transmitter was very efficiently positioned well inside the inner part of the plastic cover, and it was very nicely equipped. The provided transmitter is quite strong along with speed controls and extra features like flips, trim. The height and location positioning function work really well even in strong wind conditions. After editing the sample video for hours, the battery still works exceptionally well. The battery will surely live up to your expectations. You can capture over eight minutes of FPV video, and it will not exhaust the battery. Flights over ten minutes are quite common with this drone. It has three flight modes for easy handling, and even small kids can play with it. The additional SD card slot gives you the option to store your recordings. Easy speed control and direction change are possible. Battery performance is really good. Drocon X708W is a high-quality drone, which is really great for beginners. It is equipped with real-time Wi-Fi connection and 720p wide view camera. If you are buying your first drone, then this is definitely a very good choice. Drocon drone is made up of quality materials, and it comes at an affordable price. It provides the one-key return feature for easy control. With this amazing feature, you can easily call back your drone to its starting position. The one key come back function of this item ensures you never have to worry about losing it. Wherever you are flying, just press the one key return button, and it will come back to you. The Wi-Fi connection with real-time HD camera helps to take weird selfies. Do a lot more with the camera and enjoy a live streaming feed in high definition. You can also connect it to your mobile device with the brand new FPV Wi-Fi facility. Drocon offers twin speed modes for the greater handling of the drone. No matter if you are a pro-drone pilot or just a beginner there is a speed mode that will suit your driving skills. The amazing streamline shaped structure helps in improved flight experience, and also reduces air resistance and makes the landing much easier. Now, you do not even need to worry about losing your favorite drone. Because of the latest headless mode, controlling this drone is quite simple, and multiple direction change operation can be done smoothly. One key return feature to ensure your drone’s safety. Battery performance can be a bit better. This is the appropriate drone for beginners and because of the added Wi-Fi FPV feature, flying this drone is utter simplicity. Advanced drone techniques and one-key control function make this one of the best drones under hundred dollar price tag. The high definition camera is capable of providing a first-person view while flying. Force1 Foldable Drone uses high tech stability features to provide enough stability during landing. This amazing drone has a six-axis gyro, which is rarely seen in low price models. The altitude hold function gives a better view of the surrounding area. Headless mode makes sure that the drone is safe. Combining the altitude function and the headless feature, we can surely say it is one of the most stable and easy to fly drones we have seen. With this amazing drone, you can easily execute one key take offs, smooth landings and tricky flips. It is not a racing drone, but still, you can perform many tricks with it, because of the simple control system. With the Force1 drone, record live video and images with the fantastic 720p camera. Get added functions like zip, zoom, dip, and dive. Exciting features of this model helps to do a lot more than normal camera recording. It is quite easy to set up this drone, and the instruction set is also simple. You can also vary speed modes to tackle bad weather conditions like high-speed winds. The camera does not perform well in low light conditions. One-key return feature to make sure your drone is safe. Altitude function and headless mode for easy direction change and smooth landing. Battery performance can be better. Low light image quality is not that good.